So the TTC has been starting to heavily advertise their new transit plan for Toronto and our neighbours. I've seen Transit City ads on the subway and in the papers. I really excited about this. I think it's a great plan that would greatly improve public transit in the city. I just wish we had it now. I would used the Don Mills Rd line everyday. But sadly, of course, it can't be instantaneous. I just hope it does happen, as I don't believe they're secured funding from the various levels of government that will need to cough up some cash. 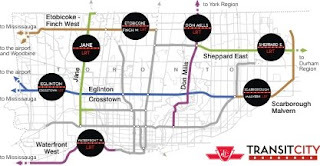 One thing they do have funds for though, at least, the last time I checked, is the extension to the University/Spadina line to go north to York University and beyond. I posted a picture of this extension as shown on the new subway car sample at The Ex. The Toronto Star had an article the other day on the architects the TTC is choosing to design these new stations. Unfortunately, at least in my opinion, one of them is the man designed the extension to the OCAD. I really, really, dislike that hideous building. 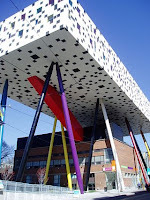 It describes it as the, "celebrated "flying tabletop" at the Ontario College of Art and Design." Great. Celebrated. I hate that thing so much. Unfortunately, I'm a minority with that opinion. Most people I know seem to like it, claiming that it's nice to have something different. I agree, as long as it's not hideously different! I mean, at least they could have painted the top pink, so it would look like an eraser sitting on top of pencils. I mean, it would have been slightly more hideous, but at least a funny hideous. Anyhow, my post on my excitement over the coming TTC has turned into a rant about the OCAD, so I should stop. At least I didn't get started on my hatred of the stupid ROM extension. That would have been worse. Posted by Andrew at 11:48 p.m.